How Do You Say Wall Street Crisis in French? Banks are going bankrupt, credit has disappeared, worldwide markets are falling, the Russians have halted trading, China’s communist government is about to buy Morgan Stanley and the American government is bailing out firms that less than one week ago were considered Wall Street giants. All of the sudden recession is a happy word and the word you don’t say out loud starts with a D.
The Wall Street Journal calls it the “Worst Crisis since 30’s, With No End in Sight“. Feeling a little bit anxious? Need to get your mind off your retirement savings and stock portofolio for a while? Easy. Just pick up a copy of one of Québec’s French-language newspapers and travel to a world where the crisis hasn’t arrived yet. 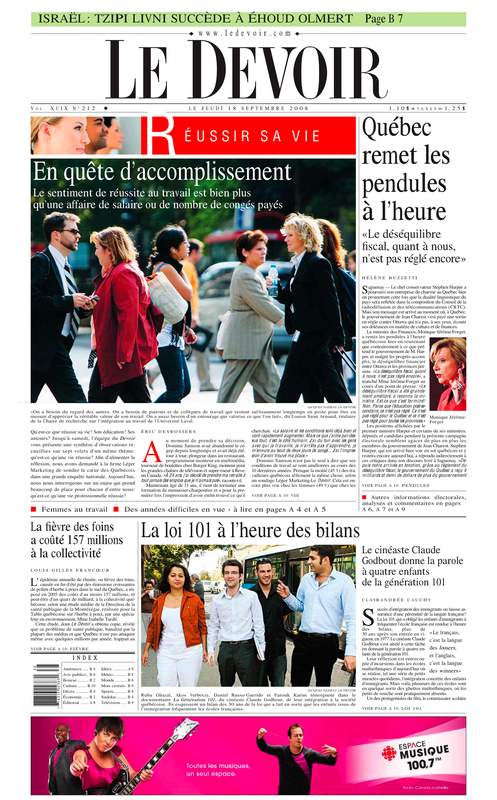 Two out of Montreal’s three French-language dailies managed to fill their front pages on Thursday September 18th 2008 – after the US government’s bailout of AIG failed to stabilize panicked markets – without printing a single word about the unprecedented upvheal currently rocking the financial world. 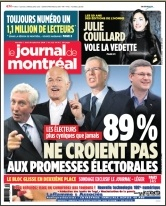 Québec’s biggest daily, le Journal de Montréal leads with an exclusive poll revealing that voters – shock! 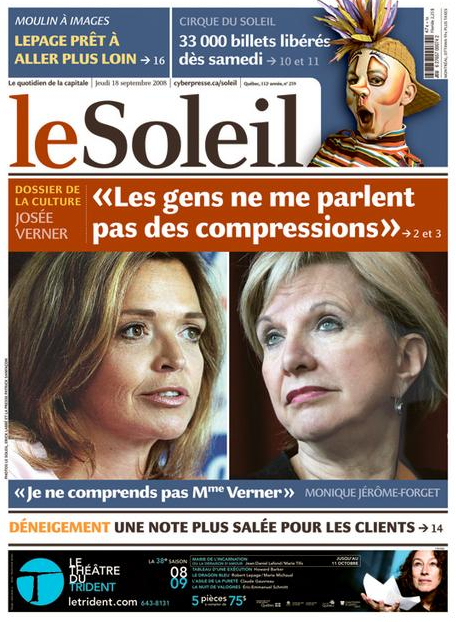 – don’t believe politicians’ promises and Le Devoir remains convinced that their series on ‘Succeeding in Life’ is what is on readers minds right now. 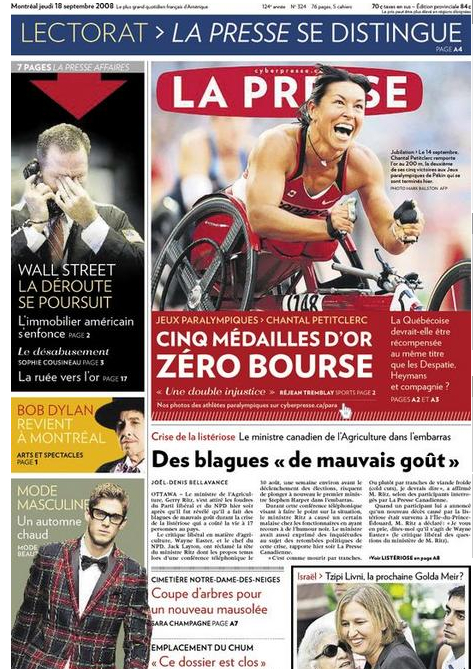 La Presse has a small teaser on the front page sending readers to inside pages for more about the markets. Only The Gazette printed a front page article on the crisis. 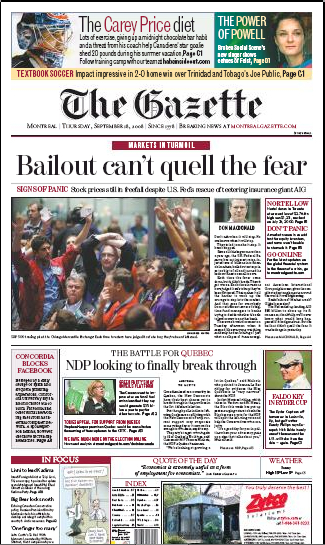 Of Gesca’s seven dailies, only La Presse, Québec City’s Le Soleil and Ottawa/Gatineau’s Le Droit published a secondary headline about the crisis. 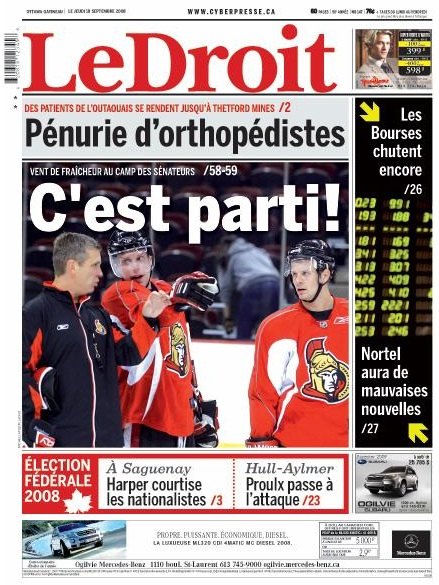 Gesca’s papers have a monopoly on daily newspapers in Québec, except in Montreal and Québec city.